Despite being the smallest country in the world, Vatican City packs a mighty punch in the tourism stakes. Home to the pope, a great selection of beautiful churches and an art collection to trump anywhere else on the planet; there’s a huge amount to see and do in Vatican City, even though it only measures in at 0.44km2. To give you an insight into what to see, do and eat during a visit to the Vatican, here we’ve compiled the first-timers guide to the world’s smallest country. St Peter’s Basilica is a must visit for those who are heading to Vatican City for the first time. This popular catholic pilgrimage site is the largest, and one of the best-known, churches in the world. A church was first built on the site, which is said to be the burial place of Jesus’ disciple Peter, in the time of Roman Emperor, Constantine the Great. The church that currently stands here was built in the 1500s, to replace the original church that stood on the site. The high altar is positioned over the spot where Peter is said to have been buried, and the bronze statue of the saint shows the touch of millions of pilgrims on its worn feet. Another thing you can’t leave Rome without viewing is the Sistine Chapel. No cameras are allowed in the building, so seeing the chapel’s breath-taking frescos in the flesh is the only way to do so outside of official photographs. It’s unlikely that you would even think to take photos even if you could, however, as the artwork really is overwhelmingly beautiful. It is worth going just to see the Almighty reaching out to touch Adam’s finger, but you’ll be rewarded with much more than just that. The price of a visit is included with the Vatican Museum ticket, although if you wished to see it as a smaller group this can be arranged in advance. You can’t visit Vatican City without seeing the Pope and, fortunately, there are quite a few opportunities to do so. On a Wednesday, the Pope holds a general audience, for which those wishing to attend must pick up a free ticket ahead of the event. If you want a good seat, it’s best to arrive several hours early. Sundays are also a good time to see the Pope, when he speaks to the crowds before reciting the Angelus and Apostolic Blessing. You don’t need a ticket for this, so it’s perfect if your trip is short, or you’re just unorganised! The Vatican Museums make up the world’s largest museum complex, so the best way to see it for a first-time visitor is with a guided tour. The museum has over 1,400 rooms, with only some of these open to the public, displaying just a fraction of the enormous collection of art belonging to the Catholic church. Pope Julius II founded the museum, after his patronage of artists such as Michelangelo, Bramante and Rafael led him to need somewhere to house his collection of treasures. If the artwork on display simply isn’t enough to sate your appetite, then you can also request a tour of the areas of the museum that are usually closed to the public, as long as you book in advance. Up to half of Vatican City is covered by the Pope’s perfectly-manicured private gardens, which can only be visited by the public on a two-hour guided tour. The gardens have been a place of quiet contemplation for the papacy since 1279, when Pope Nicholas III planted an orchard, lawn and garden. The gardens have been expanded since then, and the immaculately-pruned foliage and pristine lawns really are an impressive sight. Only one tour runs each day, though, and must be booked in advance. The iconic square was designed by baroque master Gian Lorenzo Bernini, and the sweeping arc is meant to represent ‘the motherly arms of the church’ gathering the crowd in her embrace. The square is always packed on Sunday mornings, as this is when people gather to hear the Pope’s midday Angelus, so if you’d appreciate the architecture without the crowd, avoid this time. If you don’t mind the crowds, however, the atmosphere is amazing and can give you a sense of the spirituality some people feel in Vatican City. If the phrase “when in Rome” has ever applied, it’s to eating as much pizza as possible during your visit to Vatican City. Avoid the tourist traps and hold out for the square, street food pizzas that the locals love. The one place you absolutely must try is Bonci Pizzarium, where the mouth-watering toppings will mean you can’t pick just one, and you’ll find yourself feeling like a true Roman as you wolf down your purchases in the street outside. Porchetta is a kind of delicious sandwich, made up of roast pork served in a bread roll with your choice of vegetables. It is usually eaten as street food, or in a casual restaurant, and is definitely best combined with a nice beer. Angrypig Biretta e Porchetta ticks all these boxes, as well as making some of the best Porchetta in Rome, so head down there for good food, good beers, and a good atmosphere. Everyone knows that the best food in Italy is the food that is cooked at home, passed down from one generation to the next. That’s why family-run restaurants like Arlu are so amazing, you can enjoy the kind of pasta that even the locals agree is as good as home cooking. As with any decent restaurant in Rome, all the pasta is handmade and fresh, and the best local ingredients are used. Order several bottles of wine and enjoy a feast for all the senses in this bustling restaurant. 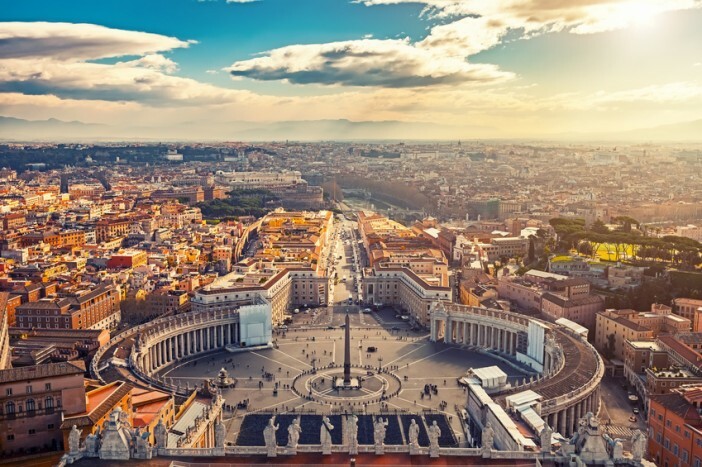 If our guide has made you want to see Vatican City for yourself, why not browse our range of cruises that stop off in the city, as well as many other exciting locations? Our full range can be seen online, or you can give our friendly sales team a call on 1300 857 345.